Contributions make an important difference for 826michigan and our students. Whether you’d like to contribute one lump sum, distribute your gift into monthly installments, or give annually on your birthday, we’ll take care of the legwork. And whether it’s $10 or $10,000, every cent will be deeply appreciated and used judiciously. Thank you! We make giving easy: simply select your gift amount, and on the next panel choose whether you’d like to give that amount one time or each month. A few more details, and your gift will power up students for success! Mail a check or money order to: 826michigan, care of Naimah Wade, Executive Director, 115 E. Liberty Street, Ann Arbor, MI 48104. Drop off your gift at Liberty Street Robot Supply & Repair or the Detroit Robot Factory between 10am and 6pm weekdays or Saturdays between 12 and 4pm. Questions about making a monthly or one-time donation? Please email Executive Director Naimah Wade at naimah@826michigan.org. Donations are typically acknowledged within about two weeks and are not anonymous unless the donor specifies.826michigan’s Federal Tax ID is 20-1963960. You can also visit our profile on Guidestar.org for more information. Thank you! 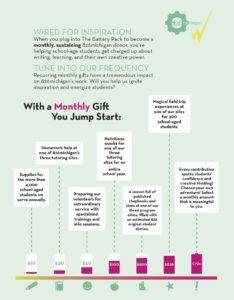 The Battery Pack – By giving monthly, your gift helps students get charged up about writing, learning, and their own creative power.